Get the perfect speakers for your home set-up with our big guide. We compare the top models and decide which one you should choose over all others. Whether you are a self-confessed audiophile that seeks perfection from their audio equipment or just a music lover that likes their favorite tunes to sound good, you are going to want some good quality speakers. This could be for use when gaming on your computer, spinning some vinyl on a turntable, to plug into your home entertainment system or to simply connect to your mobile devices so that you can hear your playlists in far better quality. The issue that you will have is when it comes to deciding on which ones to go for as they really are a dime-a-dozen these days. You could opt to just get a cheap set from some unknown brand, a set that offers good value for money at a slight expense in sound quality or you could just go all out to get the best sounding speakers on the market. With so many to choose from it could take you quite a long time to narrow your list down as well, which is why we have jumped in to give you a helping hand. We have tested thousands of speakers over the years and come across some fantastic sets while at other times we have been far from impressed with what we are listening to. We know that everybody's opinion is different and that you should not just take our word for it but we have put together a list of five speakers of varying prices that we really think are among the best that money can buy right now. Some on this list are there purely on performance while others have made the grade simply because they offer an excellent compromise of quality and value for money. Take a look and see whether you agree with our list or whether you believe there are currently more deserving models that should have been included. Take a look at how the best powered bookshelf speakers compare in the table below. Read about them in more detail and find out which we’d choose over all others. We will start off our recommendations with the Edifier R1700BT speakers which are very moderately priced compared to some of the other speakers we have recommended below. Designed to work as either bookshelf or PC speakers, the R1700BT’s offer up a combination of great looks, impressive sound quality and a host of features that you would not normally get with speakers in this price range. We have to say that the 1700BTs look great and despite having just the one finish option, that option is one that would not look out of place as part of any décor. We also like how the volume, bass and treble controls can be found on the side, rather than the back or front of one of the speakers. This allows both speakers to look the same from the front and also means that you do not have to reach behind the back to adjust the volume. The speakers come with Bluetooth 4.0 connectivity, which is rare at this price range, as well as your traditional connection options. You can also switch-out sources which means that you can have the speakers connected directly to a TV or computer and still use them with a device via Bluetooth without issue. A built-in amplifier and remote control are where the additional features end and while it is great to not have to buy an external amplifier, the remote control is rather cheap looking. 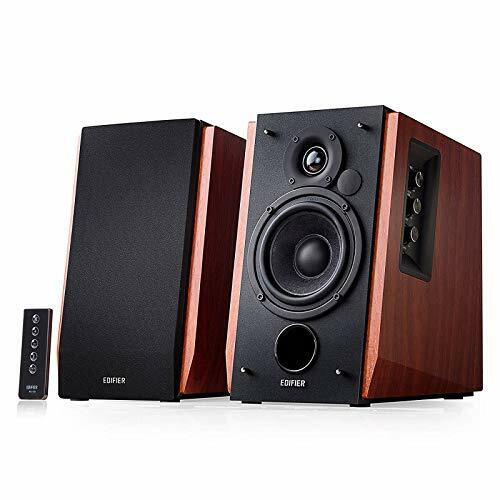 As for the sound quality, Edifier is known for being solid in this respect and for the price, you are getting a very good deal here. In the midrange, the speakers sound terrific but we do have to say that the bass is a bit too much even when turned down. The treble can come across as slightly thin as well but overall the sound quality is excellent considering the price. All said and done, the Edifier 1700BT speakers are a solid way to start our powered speaker's review and are certainly deserving a place among our recommended purchases. Cables and remote look and feel quite cheap. Highly detailed sound can sound a little muddy. Bottom Line: You will not find many powered bookshelf speakers in this price range that will be able to match up to the sound quality, aesthetic beauty, and features that the Edifier 1700BT speakers have to offer. For that reason, we have to say that they are the best budget powered speakers that money can buy. All in our opinion of course but we highly doubt you could get better value for money with any other set of bookshelf speakers. We promise these aren't all Edifier speakers! Just the first two because they are awesome. The Edifier S2000 Pro is easily the most expensive on this list but when you learn of the audio quality and the many features that have been implemented, you are quickly going to understand why. We still think that the R1700BT that we started this article off with are the best-looking speakers on this list but they are certainly pushed close by the S2000 Pro. Edifier really does make some gorgeous looking speakers and while wood finishes may not be for everyone, we really like that they put some of their focus on the design of their products. Want to have these speakers as part of an elaborate audio setup? No problem as this will give you everything that you need. On the back of the main speaker (the right one), you will find that you have just about every connection option going. XLR input, speaker out, optical in, RCA inputs and outputs and coaxial digital. If those are not enough to keep you happy, you are also able to connect via Bluetooth. An infrared remote control comes as part of the package and this is clean in design and simple to use. There are no confusing buttons and everything is laid out in a straightforward manner. You will also find some controls on the back of the main speaker should the remote find its way down the back of the sofa someday. When it comes to letting these speakers bring the sound to our ears, we would bet our house on your being blown away by the quality. The mids, in particular, are an absolute joy and you will quickly hear parts of your favorite music that you never noticed were there before. All of the speakers we have recommended understandably have good sound quality but these are on another level. A multitude of connection options. Looks great and have very impressive build quality. No output that’s lets you connect a subwoofer (though you really will not need one). Bottom Line: While these are the most expensive speakers on our list, we have no doubt in our mind that in terms of sound quality, durability, quality of build, and features, these are hands-down the best active speakers on our list of recommendations. That is what you are going to be paying your money for as these speakers perform at such a level that they would not look out of place in a music studio. If you have the budget and are extremely serious about your audio equipment, for the price that you are paying, you are getting extremely good value for money. If you are looking for small powered speakers for PC but cannot justify paying the sort of money it would take to get your hands on the AudioEngine A2+, we suggest that you take a look at the Bose Companion 2 Series III. Coming in at half the price and from one of the biggest names in audio, it is difficult to see where you can go wrong with the Companion 2 Series III. These speakers have been around for a good few years now but for many, they are still the go-to PC speakers if you want powerful sound, build quality, and a name that you can trust. On first impressions, they do not grab the attention in terms of style but then again, what PC speakers do? They look like any other set of PC speakers in truth but the beauty of these comes when you power them up for the first time. In true Bose style, you get bold and powerful sound that for the money, is close to about what you will ever be able to get out of your computer or laptop. They will struggle with the finer frequencies of sound and will certainly not replace the main sound system in your home but the quality considering the size and cost is a behold to hear. One good feature about the Bose Companion 2 Series III is that you can connect two devices to them via 3.5mm AUX jacks so essentially you can leave it plugged into your PC and just connect your iPhone or Android device without unplugging it. The 3.5mm jack on the back is reserved for your PC but simply plug a device into the handy 3.5mm jack on the front of the speaker and you are good to go. Aux cable is far too short. 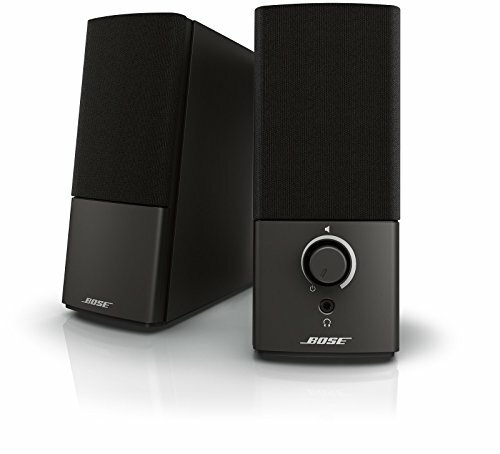 Bottom Line: If you are tired of the tinny and flat sounds that most PC speakers deliver and would prefer something a lot more powerful and crisp when gaming, listening to music or watching movies on your computer, the Bose Companion 2 Series III is a great set to consider. This is especially the case due to their price compared to the better but more expensive AudioEngine A2+. In fact, we would go as far to say that in terms of value for money, these are the best self-powered speakers you can get for your home computer or laptop. There are not too many guarantees in life but one of them is that Klipsch never makes a poor speaker. Each and every time we have tested out one of the speakers, we have always been mightily impressed with its performance. Once again, we can say exactly the same about the Klipsch R-15PM. This was actually their first forage into wireless speakers having never built one before and we have to say that this was an entrance worth waiting for. These active bookshelf speakers have a sleek, clean and smart design and you can instantly see the quality of the build from one of the best names in audio. On the back, you have all the connection options you need with an RCA input, optical input, 3.5mm input, USB port, and a welcome sub out port that will allow you to add to the music quality with a subwoofer. As mentioned you will also be able to connect devices to these speakers via Bluetooth as well. As for the sound quality of the sound, this is the main reason why it has such a good rating on Amazon – as it is close to being flawless. These are audiophile powered speakers but at a very appealing price tag. There is zero distortion to complain about, the sounds are crystal clear, and there is very little that you can against the sound quality at all. Designed to be used with turntables or simply as part of your home music system, these can be wall-mounted, put on a shelf, or just sat on the floor beneath your decks. Actually, these are some of the best powered speakers for turntables on the market in our opinion simply because of the outstanding phono pre-amp that is built-in. Numerous connectivity options and an IR remote. Bluetooth has a shorter distance limitation compared to competitors. 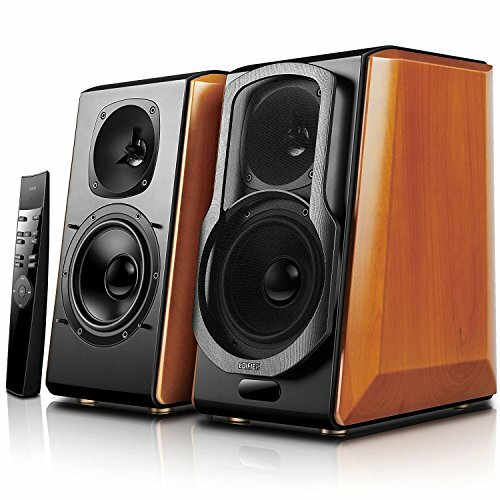 Bottom Line: The Klipsch R-15PM is a fantastic pair of speakers that could be used for a variety of uses. Small enough to be PC speakers, large enough and powerful enough to be your homes main speakers and, with enough audio clarity to be used alongside your turntables and subwoofer. For the price that they are sat at right now, it would be difficult for us to recommend any other speaker over them right now. Seriously, these need to be seen and heard to be believed and we can guarantee that you will never be more satisfied after spending money on speakers. Computer speakers are rarely something to get excited about, that tinny sound that sounds like you are listening in a phone booth is all too common once you plug in these little PC companions. However, with the AudioEngine A2+, all that has changed and for its premium price tag (in terms of PC speakers) you really should not expect anything less. When you first unbox the AudioEngine A2+ speakers, there are two things you will notice first. One is that they are small, very small in fact, standing not much bigger than a Coke can. While that alone may dent your confidence in how they might sound, this is soon boosted when you then notice the excellent build quality that they have. When you turn the speakers round and take a look at the back, you are sure to be impressed further. There are plenty of input and output options to choose from with a 3.5mm, RCA input and output, and the gem of them all, a USB-audio input. Through that variety of connections, there is a not a single device that you will not be able to connect to it by cable. Disappointingly though, there is no Bluetooth connectivity which is a shame at this price. As for the sound, it is surprisingly full, warm and crisp when you consider the small package that it comes from. Now admittedly, it is never going to be able to compete with larger high-end speakers but in terms of performance compared to other PC speakers, you are not going to get much better than the sound quality that the AudioEngine A2+ provides. These have obviously been targeted at those that use their desktop PC or laptop a lot at home whether working, gaming, or whatnot and perform much better than most other PC speakers out there. Sure, they are on the pricey side but if you want crisp sounds from your computer, a sleek design, and a good variety of connection options, the AudioEngine A2+ are the speakers to go for. Sounds packs a punch despite size. Sound quality cannot compete with larger speakers. Bottom Line: If you were to sum up the AudioEngine A2+, it would have to be big sound quality from a little mouth. There are not many that will be able to compete with these little devils on your desktop but in reality, that is the minimum you would expect with the price tag that they carry. In our opinion, these are among the best self powered speakers for PC that money can buy. We are sure that you will agree that our recommendations above are all good shouts if you are looking at purchasing some new speakers. You might not agree that some are good enough to make the top five but we reserve the right to our opinion and we are sticking by it. In terms of value for money and sound quality alone, you will not get better than those we have listed above. Not yet anyway. Now obviously, we have listed our recommendations to cover a broad scale of budgets so that most of you will have something that you can pick up. For that reason, it is quite obvious that the Edifier S2000 are the best speakers on the list, simply because they are the highest priced and are what we would buy with that money. 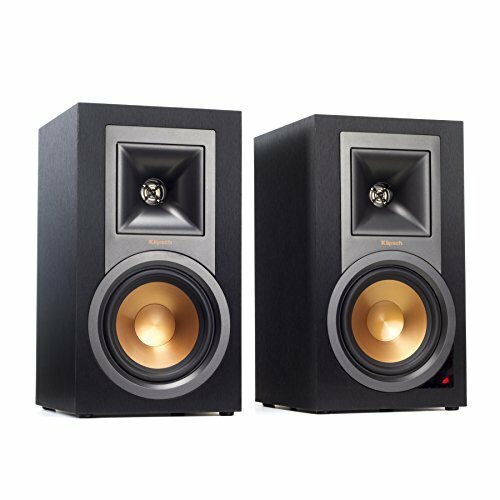 However, if we were to pick our favorite in terms of value for money, which is money spent on the performance given, we would have to say that the R-15PM from Klipsch would be our choice. They just offer sublime performance and at their current price are a complete steal. All of these speakers are fantastic though, so if you are looking for a new set, we strongly recommend that you check each of the above out to find the right match for your needs. There are literally thousands of different speakers on the market and when you are in the market for another set, you really do need to understand exactly what you should be looking out for before buying. It is not just about the price and sound quality of the speaker that you should be considering but a whole host of other things as well. In order to give you a bit of an easier task when it comes to deciding on your next set of speakers, we have produced a quick little guide that details all of the considerations you should be making before handing over the cash. The following are in no particular order as some of you will have more important priorities than others. Are you looking for the best active bookshelf speakers? Speakers for your computer? Or are you after a pair that will be able to showcase your disk-jockeying skillset to friends on the best powered speakers for vinyl? Knowing what you are going to use your speakers for is the obvious first consideration that you will have to think about before handing over the money. Will the set of speakers you are interested in buying ably perform at what you intend to use them for? Again, are you going to be holding a mini-concert in your back garden or are you after something that is loud enough for a Sunday afternoon listen while lazing on the couch? Essentially, the more watts, the louder you are going to be able to play your music. Just remember that wattages will not necessarily mean the sound quality will be good. Watts come cheap these days but it is the sound quality that will bump the price of a speaker up. As with buying anything you will want your speakers to live a long and healthy life so that you do not have to fork out for some more. Unfortunately, many speakers are poorly made so it is important to buy a brand that has a reputation for creating speakers that not only perform well but also have a build quality that will ensure they last for many years to come. As for the weight, this should not really be too much of an issue unless you are a budding DJ that will be carting them all over the country for gigs. Even then, the friends coming with you that you sorted free tickets for will surely not mind doing the carrying. Speakers can range to the small type that will sit next to your PC monitor right up to those used to perform at gigs which are huge. 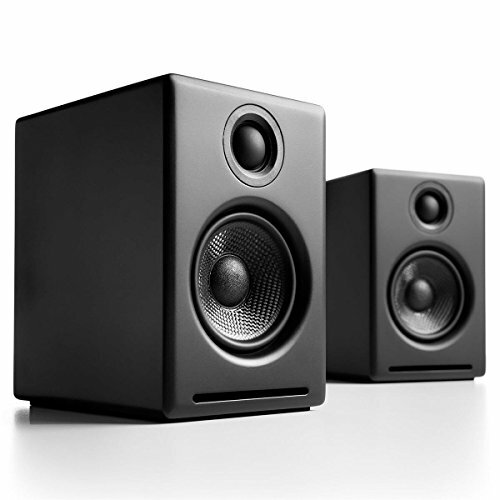 Obviously, you do not want to go to gigs with PC speakers or use massive speakers for your PC (well actually, some of you might) so choosing speakers that are the right size for their particular purpose is something that you will have to think about. Just think about where you are going to be putting your speakers and take a note of the maximum size that will fit there. When you are browsing for new speakers you then just have to take a look at their specifications to see if they will be able to fit sufficiently. Who would have thought it? You will have to consider the sound quality of the speakers that you are buying - unless of course you are easily pleased. Generally, the better the quality of sound, the more you are going to have to pay. This is why the biggest brands in audio are always on the expensive side as their speakers are usually the best active speakers on the market. If you are an audiophile you will no doubt want speakers that can pick up on the high frequencies and will have set standards to the quality that you get. On the other hand, if you like to listen to music but are not overly fussed but just want some good output at a decent price, you may be happy enough with some moderately priced speakers. The design is not everything of course when it comes to speakers but you will want to consider it if the speakers are going to be used in a main room in your home. The colour and style will have to match the rest of the room and any other audio equipment that you might have. At the end of the day though, speakers are there to make quality sound and not to look pretty. There are some great looking speakers out there but what you choose will obviously come down to your own taste. Again, depending on how you plan to use your speakers will determine the type and number of connectivity options that you require. If you are planning to use your speakers for your computer only, you are not going to want much more than a 3.5mm jack and possibly a USB input but if you are planning a more intricate audio setup, the more options you have the better. Bluetooth and Wifi connectivity will also be a consideration to think about if you want to be able to connect any of your mobile devices to enjoy your playlists on. Will your budget extend enough to allow you to pay for the best active speakers going or are you going to have to settle for some that represent better value for money? While the very best will set you back a lot, you will be surprised to find some excellent speakers that will be available at some very appealing prices too. What you pay will come down to what you can afford and the purpose you plan to use them for. If you are a DJ or musician that will rely on a good set of speakers, you really should be looking to fork out more for quality. On the other hand, if you are only going to use your speakers fleetingly, you will probably want to consider saving some money to put towards something else for your home. If you know that your speakers are going to be protected by a warranty for ten years, you are going to feel a lot more confident about their quality. If a company is willing to cover them for that long it would mean that they are confident that they will not suffer any issues in that time. This is why the length and type of warranty is a major consideration point. You should always find out about the warranty before buying while you can also do a bit of research online to see whether there are many people that have had issues with your potential model before. We do hope that you found our buying guide extremely helpful and that the reviews on our recommended speakers have given you plenty of food for thought. Buying a new set of speakers is not as straightforward as you might think as there are so many variables and considerations that you have to make.